(Sept. 30, 2016) – The annual evacuation exercise for the Portland Aerial Tram is set for Sunday morning, Oct. 2. The exercise will begin at 9 a.m. and should be concluded by noon. News media seeking access will need to follow the instructions below and contact OHSU by 8:30 a.m. on Sunday. The Portland Aerial Tram is owned by the Portland Bureau of Transportation and operated by OHSU. This photo shows the evacuation drill conducted in 2013. 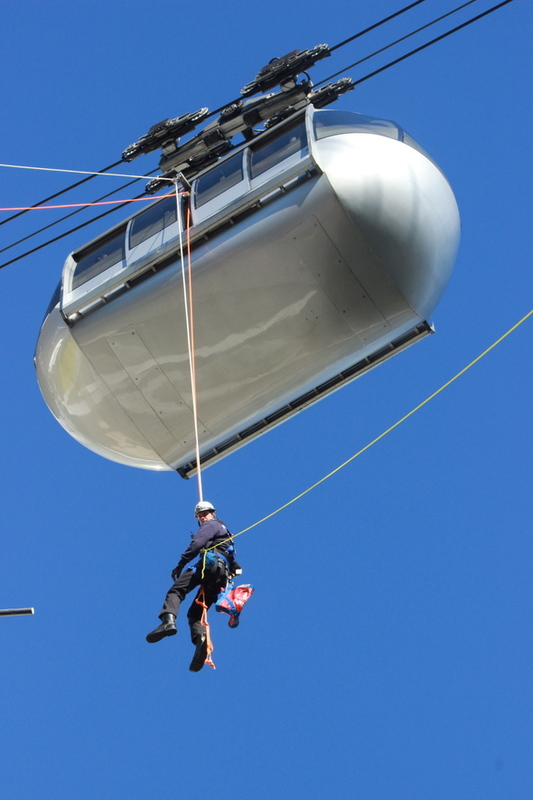 The exercise has been conducted annually since the Portland Aerial Tram opened in 2007. Photo by Felicity J. Mackay, Portland Bureau of Transportation. 9 a.m. Sunday, Oct. 2, 2016 - The exercise should be completed by noon. The training will take place above the OHSU Casey Eye Institute parking garage. At that location a small number of exercise participants will be evacuated from the tram and lowered via ropes and harnesses down to the top of the parking structure. Local news crews are welcome to cover the training but arrangements must be made before 8:30 a.m. on Oct. 2. To arrange access, contact the OHSU operator, 503-494-8311, and ask for the on-call media coordinator. The Portland Aerial Tram is closed on Sundays during the fall and winter. As a result, the training exercise will not interfere with regular operations. For those interested in observing, please do so from nearby locations and refrain from entering the Casey Eye Institute parking lot.